WordPress has a great user management system that’s why many use it to create multi-author websites and blogs. The reason why WordPress user management is so powerful is because it allows you to extend the functionality. Often we get emails from users asking us how does Site X have such a great user profile page or registration page. In most cases those sites are adding additional user profile fields to collect and display other user information such as their twitter, facebook, blog feed, etc. 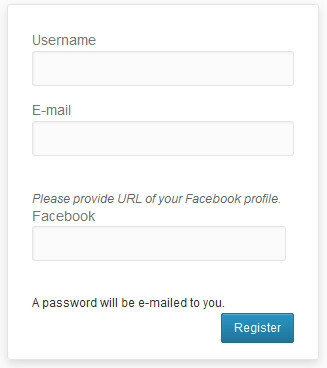 In this article, we will show how to add additional user profile fields in WordPress registration. By using this method, you can collect any additional information such as ask users if they want to signup to your newsletter while registering, ask them their twitter ID, their address, etc. First thing you need to do is to install and activate Cimy User Extra Fields plugin. Once the plugin is activated, go to Settings » Cimy User Extra Fields to configure plugin options. At the bottom of the page you will find Add new field form. 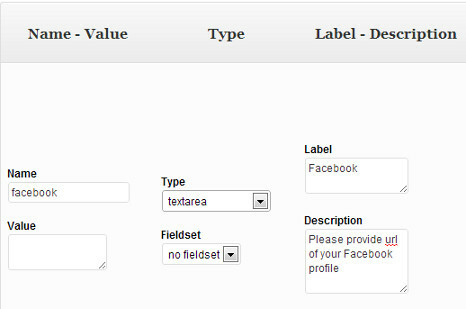 Cimy User Extra Fields allows you to add different types of fields. You can add text, textarea, checkbox, picture, picture url, and other input types. 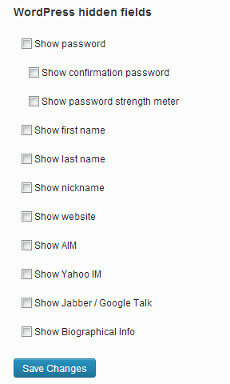 Using these fields you can add additional user registration and profile fields. Provide name, label, and description for the field. 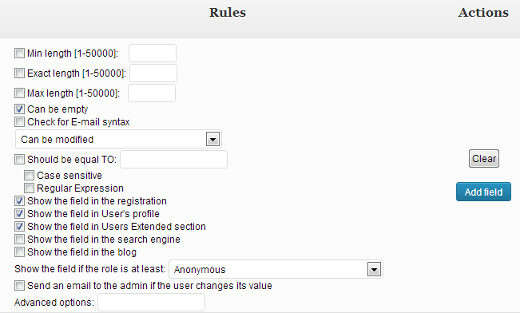 Review the Rules column to configure rules for this particular field and finally press the Add field button. Registered users can see and update this additional field by editing their user profile in WordPress. 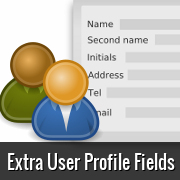 Cimy User Extra Fields plugin provides an alternate interface to manage the additional user profile fields. 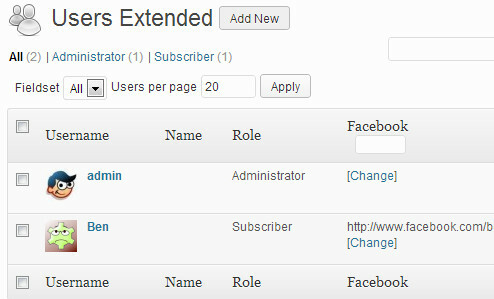 Go to Users » Users Extended to manage extended user profiles. An admin can update additional profile fields for single user as well as multiple users at once. Cimy User Extra Fields plugin can also be used to change your default registration form. You can ask the users to provide additional details which are already part of the user profile system on WordPress, but are not shown on the registration page by default. Some of these fields are First and Last name, website URL, etc. To enable these existing fields on the registration page go to Setttings » Cimy User Extra Fields and scroll down to WordPress hidden fields section. You can even allow users to choose a password upon registration. Using this plugin you can add additional user profile fields in WordPress registration which not only allows you to create powerful registration pages in WordPress, but it also gives you the ability to create detailed user profile pages. We hope that this article helps you extend user management in WordPress to improve your site. What kind of registration and user profile fields would you add on your site? Are you using this plugin or another plugin that does the same thing on your website? Let us know in the comments below. I am looking for a free question and answer plugin that can add additional information to the user profile. Such as weight, height and preferences. Need some advice here….how can I export the custom user registration fields into an excel sheet or something like that? I.e. if users say “how they heard about us”, how can I go back and view that information for a large number of users without having to individually go into each user profile? Hi everyone, i like to build stuff for WP without using external plugins, so i build my own. I sucesfully added social media fields to all users > user profile form. But i’ve stuck in adding dropdown menu for country. Is there any WooCommerce specialist here? There is dropdown functionality inside class-wc-countries.php file, and i’am dying to add the same dropdown menu in registration form and on user profile form. Of course this is taken for woocommerce, but how to extract this code to work with WC deactivated ? However, I’ve probably found a bug. I’m using WP 4.1.2 with Cimy User Extra Fields, but uploaded files are not showing up in the user’s profile and fields. Note: I can only upload files in the backend of WP. Who has the solution? Or is there a better and fully working alternative? If you think you have found a bug in the plugin, then please reach out to plugin authors using the support tab on the plugin website. I have follow all tutorial and prepare data for country, region/province & city. But I don’t how to make it selectable from dropdown list. Any sugestion how to solve this? I just found this tutorial and it really save me lots of time for my new project. I used Oi Frontend Profile to enable users to update their profile details including the fileds created by Cimy User Extra Fileds (CUEF) on frontend. It works until one of my user complaining that once he click update profile, the fields created by CUEF is gone and not updated. Only default WP fields is updated. I looked around and found other developer with the same issue here: https://stackoverflow.com/questions/11874083/wordpress-edit-user-and-cimy-user-extra-fields. He found a way to fix the bug by adding “cimy_uef_” to the front of fields name. I just dont understand what he meant by adding “cimy_uef_” to the front of fileds name. Where/how should I add “cimy_uef_” to fix this? Please help. Thanks. i have just added a new custom field but how do i make it as required? I guess uncheck the “Can be empty” checkbox will make it required. Yes this plugin is so good and easy to use. But I do not understand how to show an extra-field in a page. Have any short code? Can anyone help me? Lol, i didnt have time, anyways here is a better plugin than cimy and does the same thing. Do a review on it. Thanks for it, wonderful article. Great article, very helpful! Do you know if it’s possible to add the HTML5 placeholder attribute to text fields generated by this plugin? No entirely sure. Please contact the plugin developer for that. Thanks for another great post! This is the most valuable page I follow! Thanks for the great plugin info. I hope you won”t be recommending Code Canyon / Envato – premium plugins. I’ve just had the nasty experience of purchasing one of their products. Before getting to download it the developer took it down & Envato told me that I had to deal with the developer who never answered my email. Envato does not stand by it’s customers despite collecting 50% of purchase fees! Wow. That was money down the drain.